Aplus Finetek Sensor, Inc. is pleased to announce the availability of its newest product line, the PS Series of proximity switches. 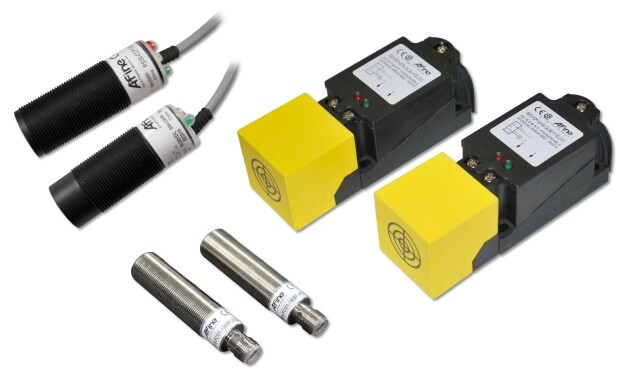 The PS line includes both inductive and capacitive style proximity sensors in many popular sizes and configurations. The PS series offers low cost and high reliability backed by a limited lifetime warranty. The PS series includes the PS30, an M30 capacitive style proximity switch, the PS18 M18 size inductive proximity switch, and the PS5W rectangular 5-way rotatable head inductive proximity switch. Shielded and unshielded construction is available as well as AC, DC and AC/DC powered configurations. DC units are offered in either NPN or PNP switch types. N.O. and N.C. switch contact configurations are available. Capacitive style proximity switches are used for sensing non-conductive materials and for level sensing of clean liquids and dry free flowing granular and some powder materials. The inductive type switches are used specifically for sensing metal in a wide range of applications such as positioning and speed sensing. The PS30 and PS18 units are very competitively priced, and the PS5W rectangular 5-way rotatable head unit is offered at the lowest cost on the market, along with high reliability. All units include CSA certification and are generally offered with “from stock” leadtime.